Vole Windows Expedition Pro 3.85.8122 was available as a giveaway on January 15, 2019! Please provide your improvement ideas using IdeaInformer widget. The top 5 comments will be rewarded with Vole Office Ultimate licenses! How would you improve Vole Windows Expedition Pro 3.85.8122? Have it index documents for searching within them. Sanwhole Office is a super Office tools package, powerful, easy to use, inexpensive and fully compatible with the latest Microsoft Word and Excel. Sanwhole Office provides free 150 MB cloud to let you share your files created by Sanwhole Office with ease. 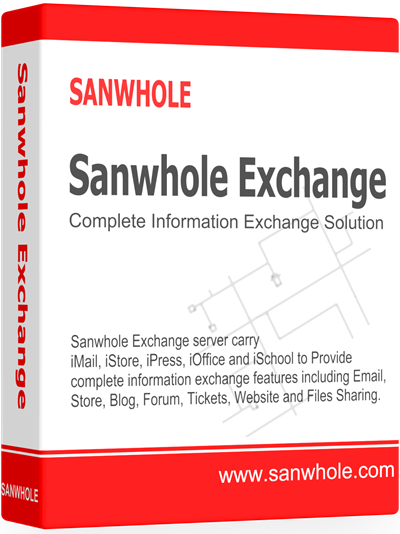 Sanwhole Exchange is a server running iMail, iPress and iStore services. iMail is an enterprise-class email server performing Microsoft Exchange and Gmail work. iPress is an all-in-one information exchange solution for blogs, forums and tickets. iStore is the business and personal online store solution. 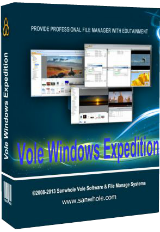 Congratulations, thanks to Kevin Bennett and Brian West's ideas for Vole Windows Expedition (2019-01-15), they each get a value of $32.00 Vole Office Ultimate LTUD software. message I get when I try to chance the theme. :Vole Windows Expedition encountered a problem and needed to close"
Been awhile since offered...but I'm going to put this comment. An error message I get when I try to chance the theme. :Vole Windows Expedition encountered a problem and needed to close"
I actually like the idea here, but it's more like v0.3 because it's missing Windows File Explorer features, like search. It's nice that it tries to show / play any file contents, but it balks at way too many file types that it does not know, needs Adobe Acrobat, can't use other PDF viewers ( even GhostScript ? ), it's deadly slow to load and refresh the screen with new information or file contents. So it's not ready for prime time yet. Keep working on it, Sanwhole Vole, make it full featured, fast, and compatible, THEN announce a real v1. , I actually like the idea here, but it's more like v0.3 because it's missing Windows File Explorer features, like search. It's nice that it tries to show / play any file contents, but it balks at way too many file types that it does not know, needs Adobe Acrobat, can't use other PDF viewers ( even GhostScript ? ), it's deadly slow to load and refresh the screen with new information or file contents. So it's not ready for prime time yet. Keep working on it, Sanwhole Vole, make it full featured, fast, and compatible, THEN announce a real v1. .
On my desktop I use shortcuts in folders. Easy, practical and faster. I create shortcuts so I don't have to remember the location of my files. Is there any advantage of using Vole Windows Expedition Pro compapred to using shortcuts? I create shortcuts so I don't have to remember the location of my files. Is there any advantage of using Vole Windows Expedition Pro compapred to using shortcuts? This is useless software because it works on Net4.52 whereas Windows 10 has a more advanced Net installed. Please test the Giveaways before you offer them. This is useless software because it works on Net4.52 whereas Windows 10 has a more advanced Net installed. Please test the Giveaways before you offer them. Coen Heydenrych, I could install the GOTD-program in Win10 without any problem. And most of the time .Net4.x is downwards compatible. Coen Heydenrych, I could install the GOTD-program in Win10 without any problem. And most of the time .Net4.x is downwards compatible. Coen Heydenrych, Not everyone here uses Win 10, therefore not everyone here has .Net 5.1 or 4.7 already installed. And as Oootje pointed out, those 2 are backward compatiable. Please think of other users, who are on Vista/Win 7/Win 8.1 before jumping to conclusions. Coen Heydenrych, Not everyone here uses Win 10, therefore not everyone here has .Net 5.1 or 4.7 already installed. And as Oootje pointed out, those 2 are backward compatiable. Please think of other users, who are on Vista/Win 7/Win 8.1 before jumping to conclusions. DJ, Windows 10 users have now surpassed the other windows versions. I stick to my opinion that this is useless software - I cannot use it, therefore it is useless. In addition, it opens in an Eastern language, not English. What was offered as a Giveaway, is useless. DJ, Windows 10 users have now surpassed the other windows versions. I stick to my opinion that this is useless software - I cannot use it, therefore it is useless. In addition, it opens in an Eastern language, not English. What was offered as a Giveaway, is useless. "Please test the Giveaways before you offer them." is moot. Second, I do not know what you did to screw up the download, but I am on the newest Win 10, it downloaded and installed fine and is in english. Coen Heydenrych, I don't care if Win 10 users are more now...not everyone uses Win 10 and GOTD does not just support Win 10 users, hence this point in your first reply "Please test the Giveaways before you offer them." is moot. Second, I do not know what you did to screw up the download, but I am on the newest Win 10, it downloaded and installed fine and is in english. Total Commander shareware, have to pay. Multi Commander 32Bit or 64Bit portable, FREE. Double Commander 32Bit portable, FREE. Total Commander shareware, have to pay. Multi Commander 32Bit or 64Bit portable, FREE. Double Commander 32Bit portable, FREE. XYplorer, QDir, Nexus File... you are all welcome. Completely locked up on first attempt to use it. Great idea but very poor execution. Too bad as I really want a decent file manager that provides full previews of all file types. 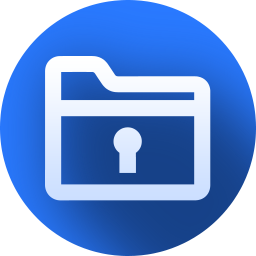 As for the app itself I won't go much into functionality as it is clear that it should represent some kind of file manager with additional tools you might or might not find useful. However, for me, it fails on the user-friendly and intuitive part of the UI. For example, icons on the buttons looks like if they were chosen by random and I would never guess what their purpose is, unless I hover over the icon. Also, upper ribbon has large icons occupying precious viewing space (it can be minimized though). Then you have "Tools" button which just opens another panel with only 3 large buttons on it... plus, you have MD5 tool which could be done on right-click instead of a new dialog where you search for the file just to calculate the hash. All in all, from my point of view, I'd suggest to work on the UI, to make it more intuitive and modern looking, without overloading it with bunch of unnecessary dialog windows/panels. Huh... Not sure where to start with this app, but for sure there's a lot room for improvement not only in the app itself, but also on it's webpage... For example, main homepage (and it's product subpages) looks ok-ish, however, when you enter the Sanwhole Account page, everything is so huge and looks outdated :)... there are tables with lot of info (as in too many columns), weird choice of colors (for example, turquoise font on blueish background), lot of bold, non-formatted and non-aligned text within cells, etc... As for the app itself I won't go much into functionality as it is clear that it should represent some kind of file manager with additional tools you might or might not find useful. However, for me, it fails on the user-friendly and intuitive part of the UI. For example, icons on the buttons looks like if they were chosen by random and I would never guess what their purpose is, unless I hover over the icon. Also, upper ribbon has large icons occupying precious viewing space (it can be minimized though). Then you have "Tools" button which just opens another panel with only 3 large buttons on it... plus, you have MD5 tool which could be done on right-click instead of a new dialog where you search for the file just to calculate the hash. All in all, from my point of view, I'd suggest to work on the UI, to make it more intuitive and modern looking, without overloading it with bunch of unnecessary dialog windows/panels. Iggi, "a lot room for improvement not only in the app itself, but also on it's webpage..."
Improvement(s) a lot OF room ....on ITS webpage. Iggi, "a lot room for improvement not only in the app itself, but also on it's webpage..." Improvement(s) a lot OF room ....on ITS webpage. When entering code from readme.txt, the Purchase Code is invalid! Fixed, a space before the password appeared while copying. All activation instructions work. Just read and understand. The program works sensational! Good job. Thanks. I'm a committed GAOTD user - don't complain about anything that's free. But today I've hit an obstacle. The activation instructions don't work! You cannot click on the Welcome message to enter details - not linked to anything. I'm a committed GAOTD user - don't complain about anything that's free. But today I've hit an obstacle. The activation instructions don't work! You cannot click on the Welcome message to enter details - not linked to anything. Endomondo, 4GB of RAM and a dual-core processor are slow by today's standards. Now days 16GB RAM and a quad-core proc are pretty standard. Not trying to knock your system. But you're right, Expedition Pro could have been slowing your computer down. Particularly if you have other software that are starting with your computer and running in the background. Peace. shegeek72, yes you are right Dual Core is probably a tad little older to todays standard. But my computing experience hasn't been hampered. Dual core is pretty neat system if one has XP or 7(I am on Dual Boot). Dual core is still capable to run in any Govt Dept and in any Corporate environment. I don't think anyone will moan and groan will Dual-Core. I have atleast 8-10 program that runs during start-up, and it still feels like a breeze. Its very very decent machine, although gamers would want to switch to 64x and 16 Gig Ram, and all those who use Photoshop or Premiere or Video Editing. Ohhh Pentium III & IV was very very slow, now how has time changed. shegeek72, yes you are right Dual Core is probably a tad little older to todays standard. But my computing experience hasn't been hampered. Dual core is pretty neat system if one has XP or 7(I am on Dual Boot). Dual core is still capable to run in any Govt Dept and in any Corporate environment. I don't think anyone will moan and groan will Dual-Core. I have atleast 8-10 program that runs during start-up, and it still feels like a breeze. Its very very decent machine, although gamers would want to switch to 64x and 16 Gig Ram, and all those who use Photoshop or Premiere or Video Editing. Ohhh Pentium III & IV was very very slow, now how has time changed. Endomondo, any of the i5 or i7 range CPUs that have a U suffix on their number are still dual core NOT quad core often used in mobile devices allegedly to reduce power consumption but I think they are just normal chips with defects found in 1 or 2 cores and are reconfigured to use 2 of the remaining good cores and sold off to OEMs cheap for mobile devices pretending they are specialy designed low power chips. You will find many Windows 10 laptops using U suffix chip numbers with only 2 physical cores. Endomondo, any of the i5 or i7 range CPUs that have a U suffix on their number are still dual core NOT quad core often used in mobile devices allegedly to reduce power consumption but I think they are just normal chips with defects found in 1 or 2 cores and are reconfigured to use 2 of the remaining good cores and sold off to OEMs cheap for mobile devices pretending they are specialy designed low power chips. You will find many Windows 10 laptops using U suffix chip numbers with only 2 physical cores. shegeek72, i5 and i7 chips with U suffix on their model numbers are current and only dual physical cores. Go look at previous giveaway of this, it too had blocking thread problem on even moderatly large folders and that obviously has not been fixed yet after 5 years of development. TK, True they have 2 logical cores, though they have hyper-threading that simulates 4 cores. It's like my AMD FX-8350 that has 4 logical cores with AMD's version of hyper-threading that appears as 8 cores to operating systems and software. I am curious about this program and would appreciate reading as many comments as I can. Just download and install it. You can uninstall it if it doesn't do what you need. em... Manage code and text file i use vs code, its open file and search is well. Manage photo , I use google photo. manage file, potplayer is powerful. This software is all-in-one, including anything but any of them is week. If you want a simple software manage simple files, do simple works, maybe this is useful. jame bush, Agree, this soft has a lot of feature. But poor interface.